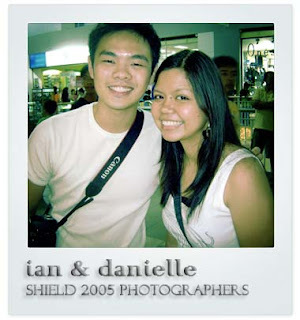 Look who I found at SM City Davao yesterday (December 30, 2009)!!! 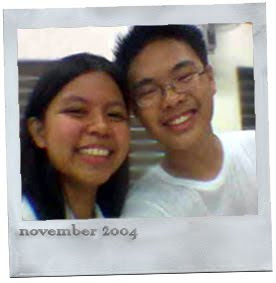 I've been missing him soooo much since the day he graduated but I never knew that I would stumble over him one of these days :D And yes, it has been over FOUR FREAKIN' YEARS since we last saw each other. Kaya naman super smiles kami when we saw and spoke to each other :D Weeeeee. 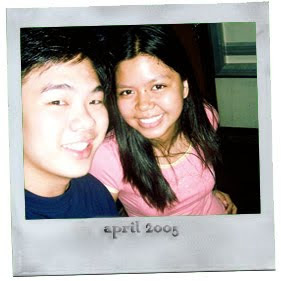 Anyway, the point is, we saw each other yesterday and had a little chit-chat and that's very enough to complete my 2009. It was never my intention to hurt anyone and yes girl, that includes you. I thought this issue was way over between the two of us. But now, you are putting it back on. And seriously, you scare the hell out of me every time I see you walking down the hallway. And once again, you being hurt is not my fault. No guilts here. Swear. I gave you the chance. I let go. Then I hoped that he'd come to you and live happier in your presence. You were happy and the thought made me feel satisfied and happy. 1. I never took him away from you if he's the one who came to me and said that he misses me a lot. 2. Never ASSume again. Please. It's for your own sake. Try Bob Ong's quotes. It bull's-eyed you, right? I think, under certain possibilities, I'm not the one who makes his heart skip a beat. But what I am certain, that it is not YOU. I'm really sorry. Last Friday afternoon, for the sake of our laboratory experiment in MCB150, we had to collect about 54mL (more or less) of human blood (na-chaka kasi iyong sheep blood..anyway, don't ask :|)... So I had to find 5 people who have O as their blood type and are willing to donate 10-12 mL of their blood :) So I got me, neil, george, anj and aidz. The blood extraction started around 1pm and I asked if I could go first because I had a class by 1:30. Since George wanted to come with me, he had to go second. Kuya Weller: *puzzled face* unsa na? na-unsa mo? Kuya Weller: *shocked and puzzled face* ngano? nag-unsa diay mong duha??? "I needed you to help me decide but it turned out that you became the decision." "today, i got hurt *counts fingers* six times"
So far in my existence as a Biology student, this has been the busiest semester ever! The lecture classes, even though they are only offered as a one-hour class per meeting, the lessons that were discussed would take ages to decipher and analyze :( Laboratory classes that go far beyond the class schedule. Lunch-less days. Free time spent by reading materials for PI 100 class. And nights being spent answering guide questions. Seriously, I NEED A BREAK! It has only been 3 or 4 weeks but everything's a living HELL! My adviser told me to study for my upcoming NMAT instead of getting too pre-occupied with my thesis work because she has to use the laboratory for her research for a while. But as promised, I have to work on it after NMAT. Besides, I have to spend the entire Christmas vacation writing my manuscript because on January or so, I have to present my manuscript in a mock defense for the bio199b class which be held in Lorenzo Hall early next year. So far, this laboratory exercise in ZOO120 has been so far the highlight of my semester. I wasn't only able to learn the physiochemical reactions in our bodies but it also gave me life lessons as well :) In this class, it was my first time to make a cut through the human skin and my first patient was Aidz. It took me three tries to make the cut and after doing it successfully, I realized that the human skin is really THICK!